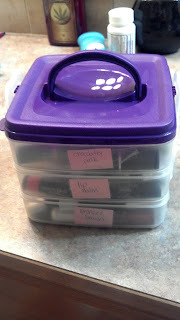 Today, I bring you a project I worked on last week- organizing my insane lipstick collection! I seriously have way too much lipstick, lip balm, lipgloss, lip stain, (you get the picture). 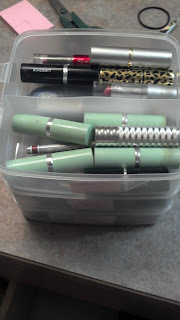 I have an entire drawer in my bathroom designated for my eyeshadows, liners, and mascaras, but don't have the space to designate another drawer for my lipsticks. For shame! In this pic above you can kind of see what I've done. I got 3 plastic bins with the handled lids at Target, each for $2.50. 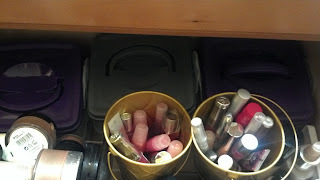 I categorized each bin by shade and put my lip glosses that are not pigmented enough to belong in a shade group in those little buckets you see. The buckets were $1 at Target. Here's what each tier looks like on the inside. Each tier is about 2.5 inches deep and has 2 sections. You could separate by doing one side of lip gloss, and the other side lip stick. I just crammed it in however it fit, as long as it was in the correct color family. I'm really digging my new organization technique! It helps me be able to locate exactly what I'm looking for each time I want to wear lipstick. 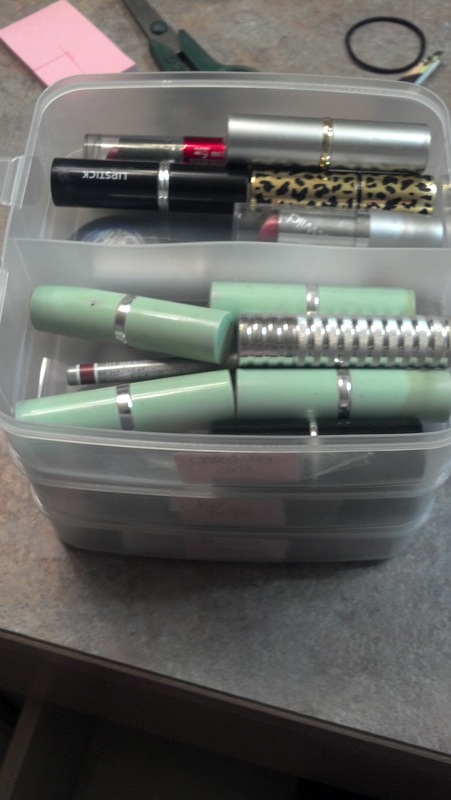 How do you organize your lipstick? Great Post with great tips. Thanks for sharing.